Situated within 8 km of Resorts World Manila and 9 km of Glorietta Mall in Manila, Siena Park Residences provides accommodation with seating area. Each unit is fitted with with a terrace offering mountain views, a satellite flat-screen TV, a well-fitted kitchen and a private bathroom with bath and free toiletries. There is also an oven, microwave and a coffee machine. The apartment offers a year-round outdoor pool. A garden and a children's playground are offered at Siena Park Residences. Greenbelt Mall is 10 km from the accommodation, while Bonifacio High Street is 10 km from the property. 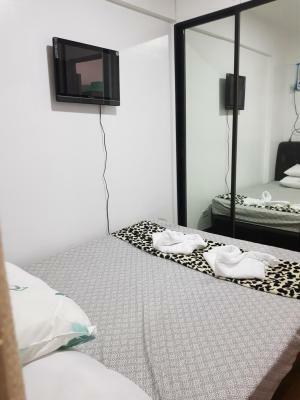 The nearest airport is Manila Ninoy Aquino International Airport, 8 km from Siena Park Residences. When would you like to stay at Siena Park Residences ? This family room has a balcony, air conditioning and seating area. This triple room features a balcony, seating area and patio. Each day we'll check prices and send you an email for your selected dates at Siena Park Residences. If you don't have specific dates but would like to check prices for say next weekend or say next month we can check the price too. Click to write a review and share your experience of Siena Park Residences with other travellers.